The second year of our bird house program has again been a big success. In the spring of 2010 we had the Boy Scouts from Troup 477 build over two dozen bird houses. The golf club provided most of the materials, cut he wood to size and provided direction on how to assemble them. I also gave a brief educational lecture on the types of bird species we were looking to attract and the significance of the design of the bird houses. Many people do not realize that the shape of the entry hole and the size of the hole have a significant effect on the species that will use it and on the success of rearing chicks. Our most successful box has been the one just outside of the entry to our maintenance facility in our bee and butterfly garden. We have had over a dozen chickadees emerge from that house alone. The other houses on the course have had varying success. Some have not had any birds in the two years and some have had chicks one year and not the next. We continue to monitor the houses weekly throughout the summer to see which ones are more successful. From this info we will move unsuccessful houses to environments, heights, directions, and cover that are similar to our inhabited boxes. Please note the two small birds pictured above were not raised in our Chickadee boxes. 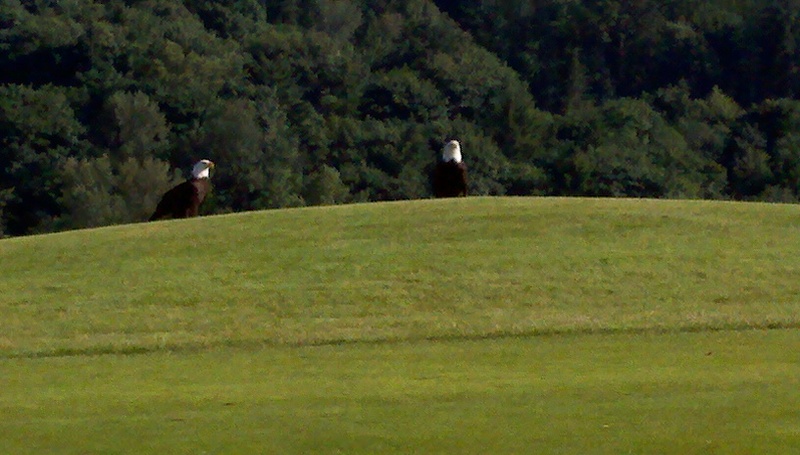 They were seen last week enjoying the sunshine on #1 Fairway on China Creek. It sure is a beautiful sight to see. I know all of you golfers are out there seeking other kinds of birdies and eagles but this double eagle makes you want to slow down and enjoy some of the other beautiful things you can see on a golf course. What an analogy. 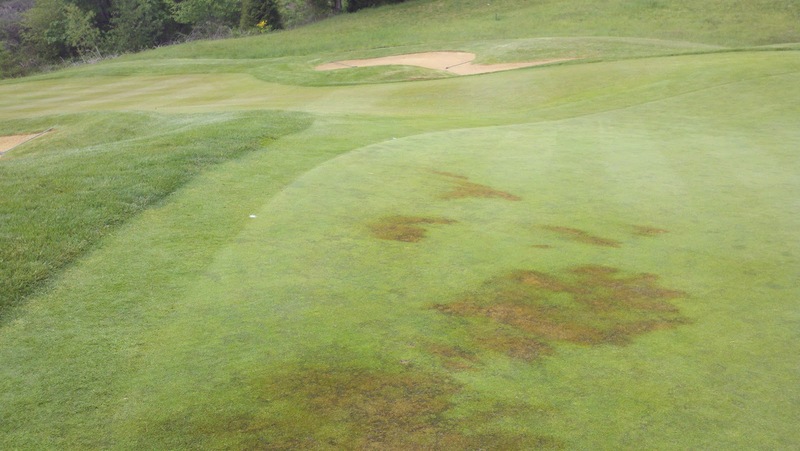 The methods we have to control moss seem to have the same effect on bentgrass as radiation has on the human body. The chemicals we use do a number on the moss but the grass doesn't really like it either. We have been using Terracyte and ferrous sulfate (iron) through the winter to injure and kill the moss. Most of the time we see minimal damage to the turf. As it gets warmer we transition to a product called Quick Silver. All of these products are a little hard on the turf and the conditions have to be just right to use them. Quick Silver seems to work best after temperatures reach 70 degrees. Since we have seen 70 degrees for a total of 5 minutes this entire year we are still waiting to switch to Quick Silver. The Terracyte is the exact opposite. We need cool and moist to avoid damage. This week we spot applied our last Terracyte application to 4 of our greens. Apparently 57 degrees and rain was a little too warm. We saw extensive tip burn to the turf where it was applied. Fortunately the damage appears to be superficial and is mowing off. It looks bad but keeping up on the moss removal is critical. So, we lost a little hair and don't feel the best. But in a week or so we will feel better and hopefully that cancer called moss will be feeling horrible. None of the methods we use eliminates the moss completely so the best we can do is stay committed to thinning it and allowing areas for grass grow into. Marching bands, 300+ players, flyovers, parades, 18 gun salutes, the former Chairman of The Joint Chiefs of Staff, Sea Gals and then a big dinner……just another day at Newcastle. We had our first big event of the year yesterday. It was a good event with beautiful weather, lots of people, and a lot of side activities that made it different from the routine 144 player shotgun. 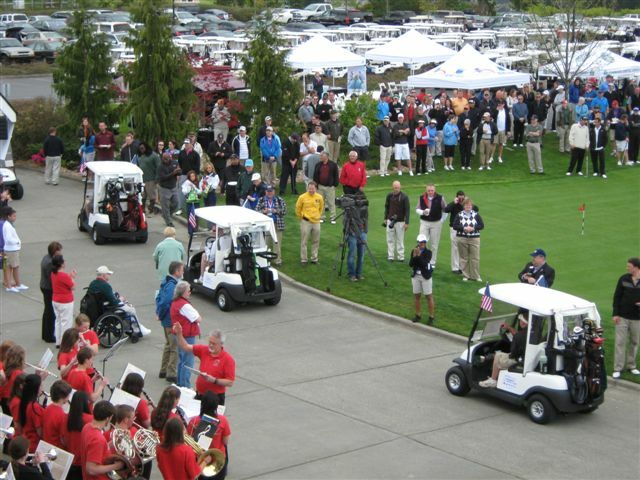 Having 36 holes and the clubhouse we do, made the event possible. With the first big event being a success we look forward to the rest of the summer. Hopefully the weather will cooperate and turn the corner as well. It sure improves moral on the turf crew when people are able to get out and enjoy the product we work so hard to provide.